After a relatively quiet week weather wise, things are about to change. 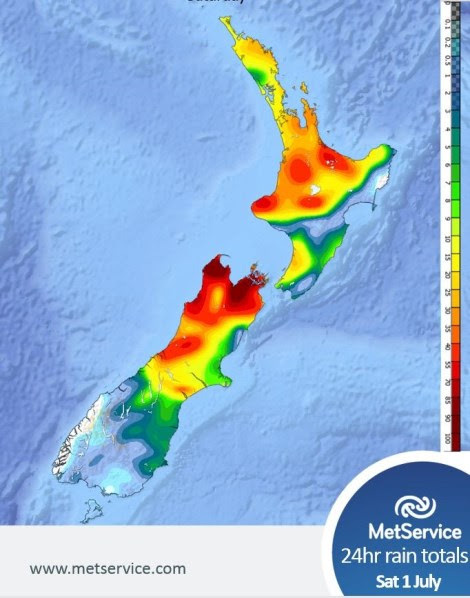 “Expect a changeable weekend of weather, with north-facing regions such as Nelson and Bay of Plenty likely to see the worst of the heavy rain,” said MetService meteorologist Georgina Griffiths. A wet and windy Friday is forecast for the north and west of the South Island, with heavy rain warnings already in place for Westland and Buller. In contrast, Friday evening remains dry in Wellington for the ReCut celebrations in Civic Square. The heavy rain is likely to spread into Nelson early Saturday, with occasional rain forecast for the eastern South Island on Saturday, too. Rain spreads across the entire north and west of the North Island Saturday afternoon and evening. Places such as New Plymouth, Northland, Auckland and the Waikato may see a burst of intense rain Saturday night or in the early hours of Sunday. During Sunday morning, heavy rain affects Coromandel and the Bay of Plenty, before easing to showers later Sunday. On Sunday, the South Island sees a few showers on and off, before a southwesterly change brings a burst of colder air and a period of rain to the far south later in the day. Looking ahead, the working week starts off with cool and showery southwesterlies. Remember to rug up warm, and take a coat.